Place rinsed pintos in a large pot, cover with 3 liters of water, drop in the onion half and bring to a boil over medium-high heat. Reduce heat to medium and keep at a constant simmer, covering partially with a lid, for an hour. Check the beans from time to time to make sure they are not drying out. If they are, add a couple cups of hot water. Once they are cooked and soft, and should be very soupy, add the salt, remove the onion, stir and set aside. You may substitute for 2 15-ounce cans of already cooked pintos. Heat with 2 cups water, season with salt to taste and set aside. Heat the oil in an extended skillet or casserole over medium-high heat. Once hot, add the chorizo and cook for 4 to 5 minutes, stirring occasionally, until it has started to brown and has rendered its fat. Add the bacon, stir and cook for 3 to 4 minutes, until it begins to brown. Add the tomato and poblanos, stir and cook for a couple minutes. Incorporate the cooked pintos and all their cooking broth, let them come to a simmer, then reduce to medium heat and cook for 7 to 8 minutes. Until the beans are nicely seasoned, all the flavors have come together, and you see some lovely puddles of red fat over the top. Turn off heat. Crumble the queso fresco over the top before serving. Hope you love the beans, Gary! Jinich “Food Maniacs” T-Shirts are available. What a yum New Year’s morning tradition…here’s to many more, Jim! Hi Pati: just found your website & wondered if you could cook the beans in an instant pot? Recipe sounds wonderful & can’t wait to try it. I’m so glad you found my website, Annette! I’m not an expert on instant pot… but please let me know if you do try it and how they turn out. I cook pinto beans in my electric pressure cooker all the time! Add the dry beans and enough water to cover with 2″. Add Tbs oil to prevent foaming (i use haberñero infused EVOO for a little kick) , 1/2 onion and 1 bay leaf. Cook on high 37 min, natural release. Discard bay and onion when done. ¡Muy delicioso ! New subscriber Pati! Caught the show for the first time today (Saturday) and these beans look amazing! Looking forward to more episodes with you and the family. Good times. You can catch it again on Amazon: https://www.amazon.com/gp/video/detail/B07L8MTJ2L/ref=atv_dp It’s season 7, episode 4. Enjoy, Patricia! Why did I not know of this trickery (or heard of this) before!? The Wife has querried, and complimented, on the tenderness of both beans and meat cooked as you have recommended. Our home is never to be short on white onions (and limes) again!!! Oh the onion gives an extra depth of flavor to the beans. And I’m so happy to hear everyone loved the beans…and that your kitchen now always has white onions and limes, Robin! Can you make half of the recipe ? Aww thank you so much Rosemary! OMG these are some awesome beans! I did drain some fat before I added the beans. excellent recipe. Can’t wait to try your others. All the best. I’m so happy to hear that your family is loving the beans, Jules. They look amazing… this weekend for sure! Do you have to soak the pinto beans overnight first? No just rinse them first. Should I soak the pinto beans overnight before cooking them? You can just rinse them and start cooking….have fun in the kitchen, Matthew. 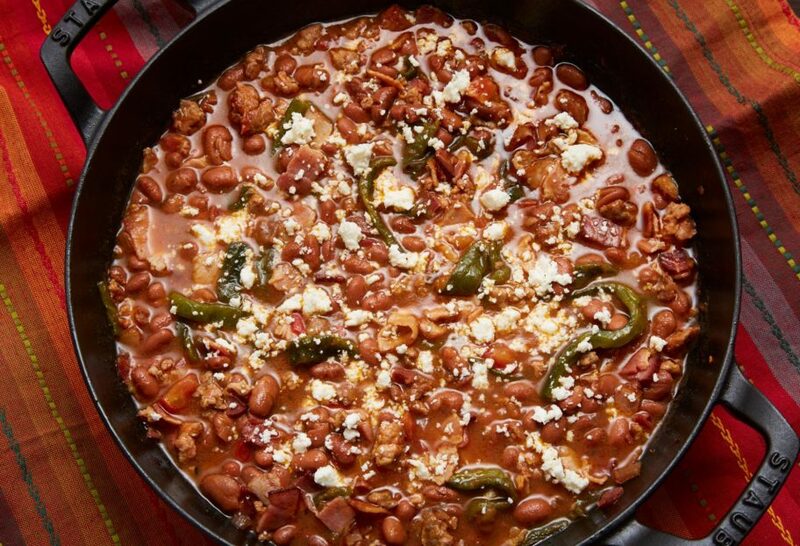 hi Paty….your beans are so good…i made my own chorizo sausage and it took two hours to cook my beans but soooo good…..the broth is so well seasonned…loved it ! Super! I’m sure you homemade chorizo made the beans extra YUM, Murielle. I use the onion to give the beans flavor while they cook…but if you want you can add chopped onion as well, Steve. Do you remove the onion once beans are cooked or does it naturally fall apart in the cooking process? Theses look absolutely delicious and I can’t wait to try!! Oh yes…once the beans are cooked, you can remove the onion. I hope you love them, Amanda!